Radio personality Leonard "EnviroBro" Robinson will be joined by Secretary Linda Adams, left, from the California Environmental Protection Agency (Cal/EPA). They will discuss her recent trip to China where she shared California's strategies and policies on climate change, low carbon fuels, green business and more. The show will broadcast live Thursday, May 14 from 10:00am until 11:00am on Sacramento Radio Station KDEE 97.7FM and stream world-wide on the internet. Listeners are invited to call in during the show with questions and comments toll-free at (877) 631-8599 and email inquiries. 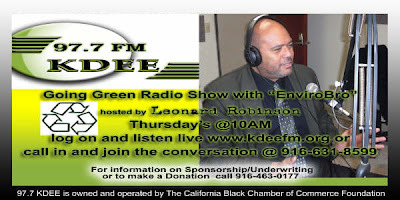 The "Going Green With EnviroBro Radio Show", the first "green" radio show on an urban radio station in the nation, is dedicated to providing its listeners with the "green" information that will affect them; their families and their pocketbook.